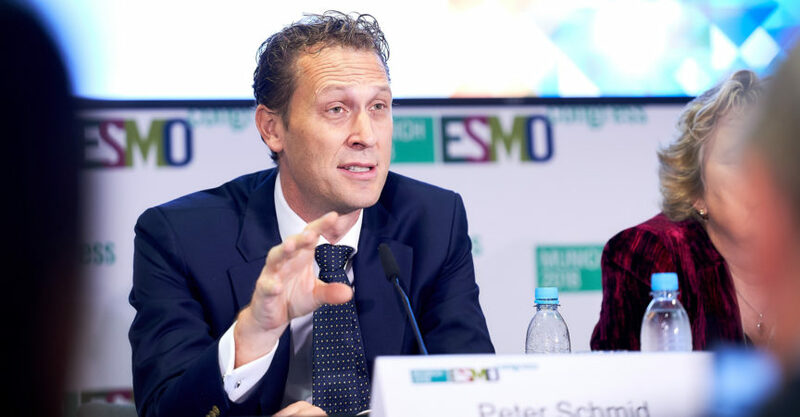 In this year’s ESMO’s first Presidential symposium, for the first time a survival benefit for patients with breast cancer treated with immunotherapy could be demonstrated. The randomized phase III trial IMpassion130 enrolled 902 patients with metastatic triple negative breast cancer. After a median follow-up of 12.9 months, patients treated with a combination of atezolizumab and the standard chemotherapy nab-paclitaxel reached a significantly longer overall survival (OS) of 21.3 versus 17.6 months compared to standard chemotherapy alone. In the subgroup expressing PD-L1 in tumor-associated immune cells, OS was 25 versus 15.5 months (HR 0.62). At the time of this interim OS analysis, more than half of the patients were still alive. The combination reduced the risk of progression or death by 20 percent in all patients and by 28 percent in the subpopulation with PD-L1 positive tumor immune cells. In the entire study population, median progression free survival (PFS) was 7.2 versus 5.5 months with chemotherapy only (HR 0.8; p=0.0025). In patients with PD-L1 positive immune cells in the tumor, the median PFS was 7.5 months versus 5 months with chemotherapy alone (HR 0,62; p<0,0001). The objective response rate was higher in atezolizumab/nab-paclitaxel treated patients, with 56 versus 46 percent in the intention-to-treat population and 59 versus 43 percent in patients with PD-L1 positive tumor cells. In general, the combination was well tolerated, with a slightly increased rate of nausea and cough in the combination group. Most adverse events seen were induced by chemotherapy. Adverse effects related to immunotherapy were rare, with hypothyroidism being the most frequent, occurring in 17.3 percent of patients treated with the combination, versus 4.3 percent with chemotherapy alone.